Recently I found myself without lunch and without the means or opportunity to go and get lunch. Because I live in America, there was a Subway nearby. 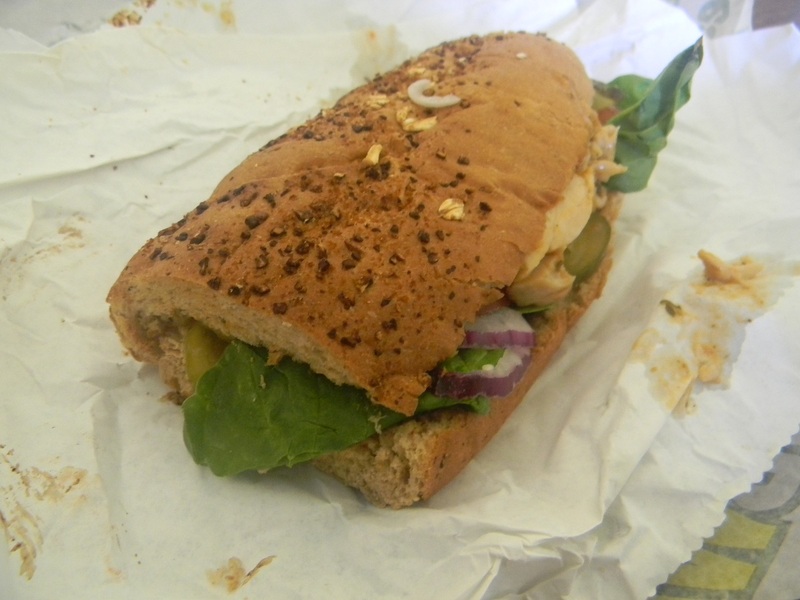 So, I shamefully admit to you, I went and got a sandwich at Subway. That’s just the way things shake out sometimes. Last time I talked about Subway I had a very specific grievance with their Pulled Pork, but today I just want to talk Subway in general. Subway sandwiches, as they are fond of reminding you, feature fresh baked bread. It isn’t really baking in any sense that you might imagine it, of course. Baking is the term for it, though, because they certainly aren’t making bread. A frozen stick of dough is thawed, proofed, and then baked. The smell drifts from the store and each and every little Subway can proudly boast fresh baked bread. I don’t eat at Subway with any real regularity, and I’m never particularly pleased to be doing so, but I’ve eaten my share of Subway sandwiches. And I can say in all honesty that I have never once paused and thought to myself “you know, this is really good bread!” And the reason I have not thought that is simple: it isn’t very good! I could forgive Subway the boasting, I could forgive them any number of Quick Service Restaurant food prep techniques if the damned bread was any good, but it isnt! There’s no crust, there’s no body, there’s all manner of crap piled on top. Herbs, oats, parmesan, it all goes on top in a terrible inadequate attempt to camoflage the rest of the loaf. They display a wide range of types of bread, but they’re all the same where it counts. Put together a sandwich at Subway that would benefit from a soft, yielding crust and put together one that needs a sharp crunch. Sorry, you’re out of luck on both ends, the only thing that’s available is some silly middle of the road that doesn’t do anyone any favors. I can forgive people crowing over great bread. And I can forgive just-ok bread if nobody tries to sell me on it. But taking the worst of both worlds and puffing your chest out over mediocrity is unforgivable. They take the sandwich consumer for a sap, arguing by assertion that their fresh baked bread is a delicious compliment to any sandwich. It isn’t true, it just flat-out isn’t true, and if there’s one thing I don’t like on my sandwich it’s a big fat juicy lie. This entry was posted in General Sandwich Discussion, Sandwich Reviews and tagged Bread, Subway by Pete. Bookmark the permalink. And that just about wraps it up for Subway! Good riddance to bad garbage, that’s what I say.